GrayMatter practices an exploratory approach to discover relationships between variables. Age, Customer Interaction and Agents the key contributors for the Lapse. Agents were cross selling other insurance policies to their own clients after initial cool-off period. Model provided Precision of 82% and Recall of 74% on a test dataset with 50000 policies. Large supermarket store customer segmentation to identify customer segments like premium customers, price-sensitive customers etc. 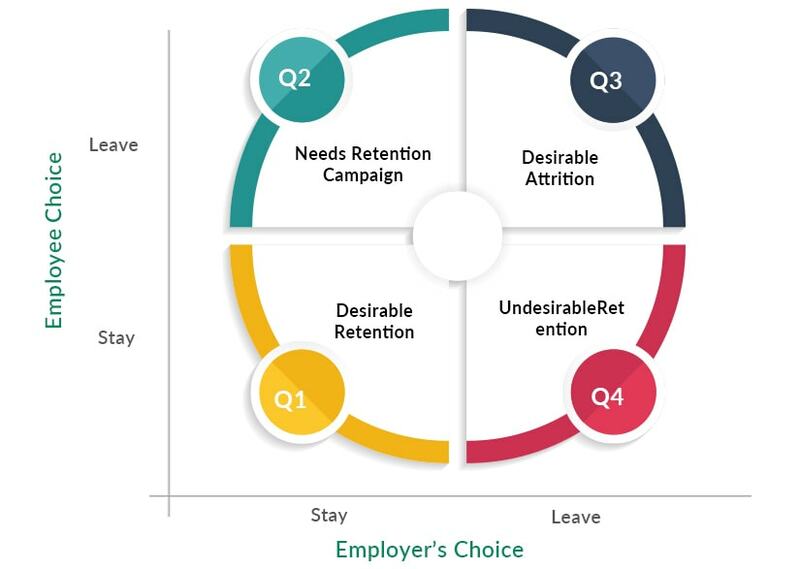 The demographics and behavior of every segment is analyzed in conjunction with the % revenue contribution of that segment to decide upon actions for the key segments like loyalty program for premium customers, product positioning specific to price sensitive customers and so on. Regression analysis for a leading alcoholic beverages company, analyzing country-wise beer consumption data to find out correlation between sales, consumption volumes & brand recall and derive predictors for sales thereof. 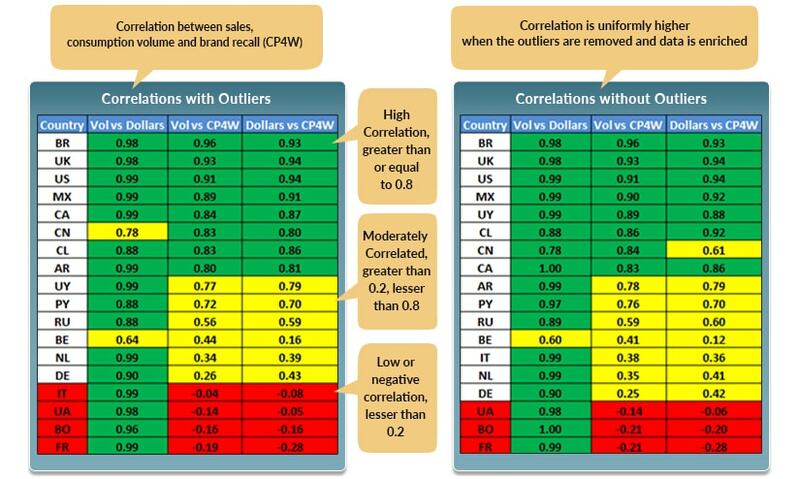 In the charts below you can see that sales and volume (consumption) are highly correlated for almost all the countries whereas sales & brand recall as well as volume & brand recall are highly correlated for 8 countries. Video analytics to enable accurate estimation of count of people in a queue, by taking into account congestion due to surrounding crowd. Applications of this include airports, taxi companies etc. 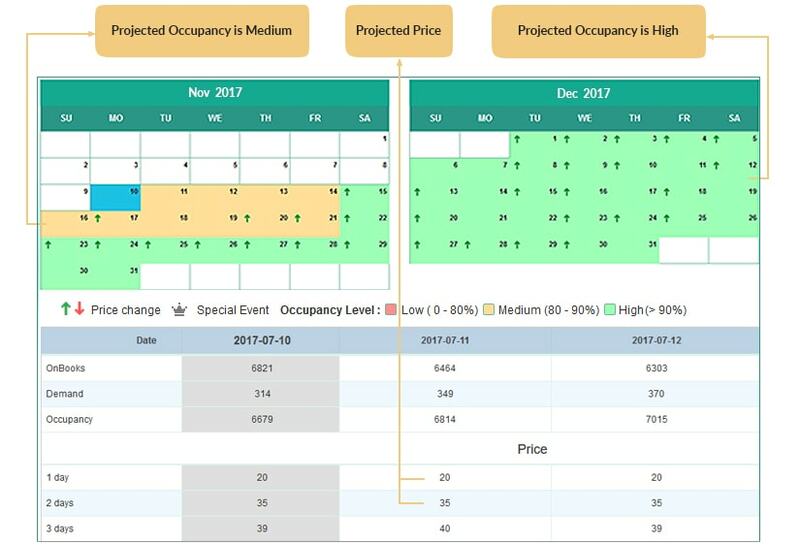 wherein resultant actions include advance intimation of wait time, opening of new counters and optimal resource allocation (security, AC, cleaning staff etc.). 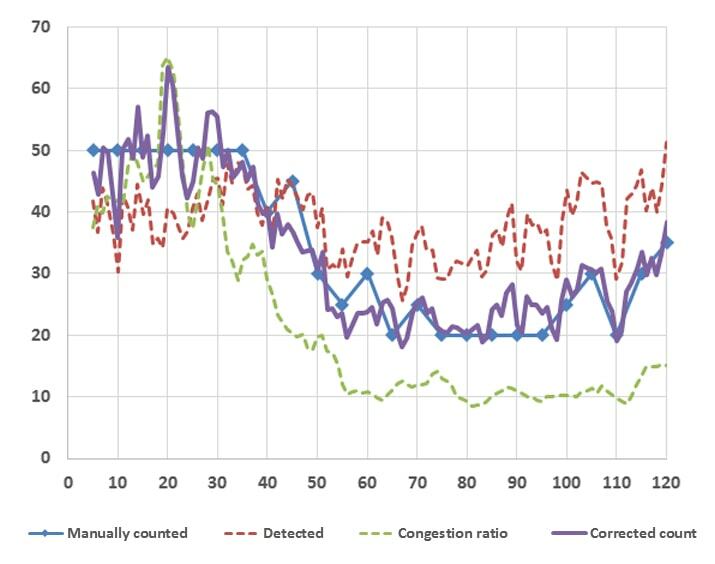 The chart below clearly shows the corrected count vis-à-vis the manual count by factoring for congestion.. Analysis of consumer sentiment towards a beverage brand, on social media. The purpose of the analysis was to gauge pre-launch consumer response to the brand, right up to date of launch of the brand. 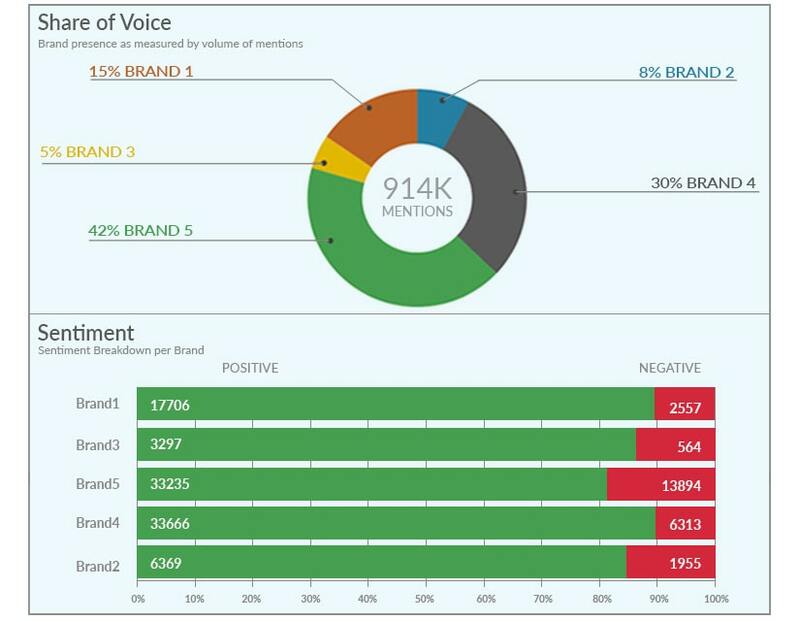 As you can see in the outputs below, the percentage share of responses/comments for every brand is depicted. The share of negative and positive sentiments for every brand are also shown. GrayMatter delivers unique, path-breaking data science solutions and services to global clientele. 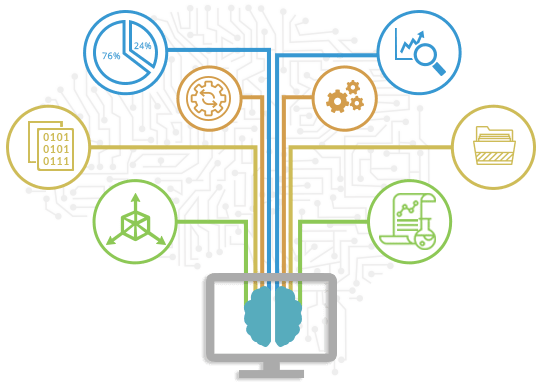 GrayMatter’s offerings range from data science consulting to actual data preparation and modelling, followed by ongoing optimization and performance tuning of the models. We also migrate algorithms, models across advanced analytics platforms. We also provide training services to increase business user adoption of data science offerings. GrayMatter’s Center of Excellence for Data Science ensures that the latest, cutting-edge offerings are offered to global clientele and the in-house competencies in Data Science are constantly enhanced, to help retain and grow GrayMatter’s presence as outstanding data science service providers, differentiated amongst the several data science consulting and implementation companies. GrayMatter has a dedicated Center of Excellence for Data Science (CoE-DS) with expert Data Scientists. GrayMatter’s Data Scientists have skills in a variety of technologies & tools including SAP PA, MS Cortana, R, SAS, Python, SPSS, Weka, MATLAB and others. The span of offerings include data science solutions like car park revenue optimization, queuing analysis, insurance lapse prediction analysis, social media sentiment analysis and others. The CoE also enables custom Data Science services for customers across verticals.